This technique is designed to relieve pain. In involves transmitting electric pulses near the area of pain via electrodes placed on the skin. TENS works according to two main action mechanisms: Gate Control and Endorphinic. GATE CONTROL is based on a principle of inhibiting the pain signal. The stimulation device generates electrical pulses which activate nerves that are large and faster than those used to convey pain. A prickling message is sent to the brain via the spinal cord and masks the pain signal during the stimulation session. 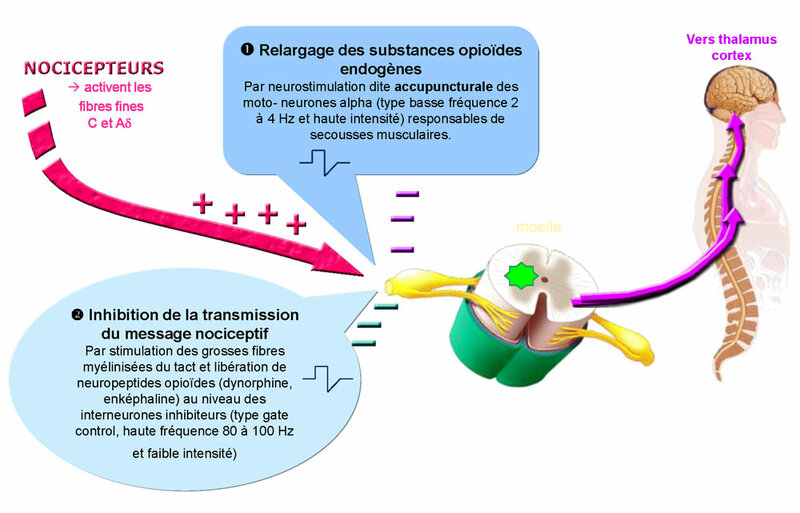 ENDORPHINIC STIMULATION favours an increase in the production of endorphins. Endorphins are an analgesic substance secreted naturally in the body. This increase generates an overall analgesic effect. TENS in endorphinic mode is characterised by a sensation of small beats. The TENS programmes offer one or other of these action mechanisms or a combination of both. The type of programme and the position of the electrodes are determined during a test session with a healthcare professional. The choice is made according to how each patient feels. TENS is a drug-free, non-invasive therapy without any undesirable secondary effects that helps to relieve chronic pain. 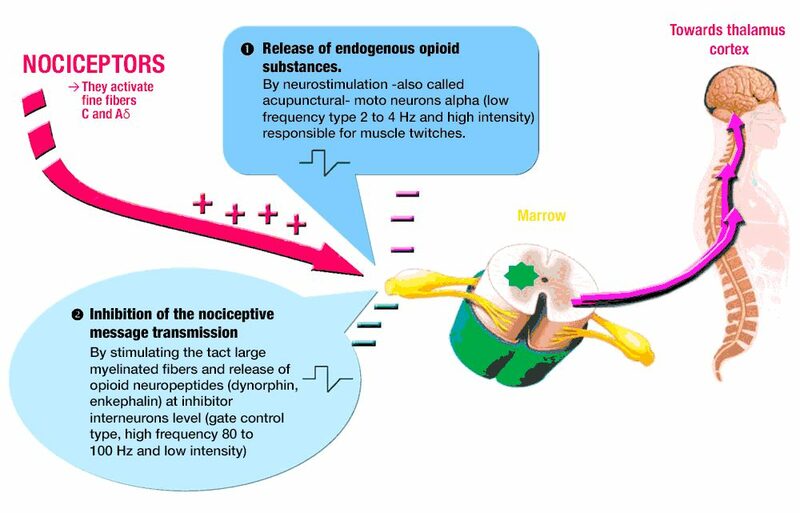 Patients who use TENS are often treated in parallel with a drug-based analgesic therapy. 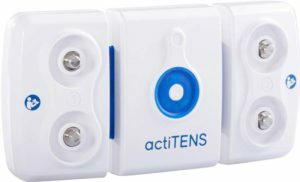 TENS can help to reduce the quantity of drugs taken to relieve pain during stimulation sessions and can also relieve pain after TENS sessions. This “post-effect” is particularly noticeable after using an endorphinic type programme. It is a personal medical device that can be used at any time of the day according to episodes of pain. TENS is prescribed in specialist pain centres. A test session is carried out during a pain consultation by a doctor or a specialist pain nurse. This session helps to determine the type of programmes most adapted to the patient, as well as the position of the electrodes. Each patient feels things differently and this test session is essential for optimising the benefits of TENS. The recommendations vary according to the patients, their clinical background and their way of life. Healthcare professionals who accompany patients take account of the patients’ way of life and their expectations with regard to the therapy in order to propose a method of use that allows them to integrate TENS into their daily life. It is generally a long-term treatment which it is important to include in a simple daily practice. actiTENS is miniature and light (65g). Its flexible design means that it can be fastened to any part of the body via the reusable adhesive support or a textile armband. Thus, it can be positioned right next to the electrodes. The length of the cables that connect the electrical pulse generator (actiTENS) and the electrodes is reduced. The overall effect is compact and it can easily be hidden discreetly under slightly ample clothing. It also allows patients to move about and live normally, without having to worry about the nerve stimulator getting in the way or the length of the cables. Then, just download the smartphone app to select a programme and session duration. Therefore, you can start a session in complete discretion.